A standard problem of English pronunciation: the English “th”. It involves sounds that many languages do not have. With a little help and practice, this is actually not very hard. There are not two but three ways to pronounce the “th.” They are indicated by three symbols in the International Phonetic Alphabet used in many handbooks, dictionaries, on the internet, etc. Since many books used to learn English use the IPA, I will use it here too. t: Thames, Thailand, Theresa, Thyme. Be careful with words like lighthouse, lighthearted, etc. Here the “th” comes from joining a word ending in “t” (light) with a word beginning in “h” (house, hearted). This is therefore a different situation. You do not say ligh-thouse but light-house. The same goes for light-hearted. A little comment to be clear. You sometimes hear about the pronunciation of the “th” sound in English. I think this is not the best way to present the problem. “Th” is not really a sound, but two letters that represent three different sounds: /t/, /θ/, and /ð/. This is the easiest pronunciation of “th,” but it is not very common. In this case “th” is simply pronounced as a regular English /t/. You will find some regional variations, but this is the way many people say “th” in some proper nouns and a few other nouns such as Thailand, Thames, Theresa, Thomas, Thyme, Esther. Beware, not all proper nouns with “th” use the /t/ pronunciation. For example, Thatcher, Thea, Thelma use the /θ/ that we will study. There are no rules to know when “th” is pronounced /t/. You learn this with practice. These two ways of saying “th” are almost the same. The only difference is that /ð/ is said with a vibration of the vocal chords, /θ/ without. Don’t worry about how to make the chords vibrate. It happens automatically if you follow the instructions below. Few languages use the /θ-ð/ sounds. That’s why many people have a problem with them. Through the years one common problem I have seen is that many people try to say a /t/ when attempting to pronounce these two sounds. The basic principle is that you must pronounce a /t/. Think only /θ-ð/, not /t/. So, how do you say these two sounds? It’s really not too difficult. Place the tip of the tongue against the top front teeth, without completely blocking the passage of the air. Then, try to say the sounds (not the letters) /s/ as in Sam, or /z/ as in zebra. The muscles of the tongue and the cheek need to be relaxed. Everything depends on the tongue being close to the teeth. If you can put the tongue close to the teeth and say /s/ or /z/ you can pronounce /θ-ð/. There are no rules to decide when to say /θ/ or /ð/. You learn this with practice. Some people suggest you stick your tongue out, but it is not efficient and is difficult in normal speech. To say the /θ/, place your tongue in the position described above (see picture) and try to say /s/ as in Sam or to blow air. The position of the tongue is the same as in /θ/, but you say the sound /z/ (as in zebra, zorro, etc., not the letter z). If you touch your throat while saying this sound, you will feel the vibration of your vocal chords. This is the same sound as the Arabic dhāl (ذ). Few words use this sound, but they are very common words. at the beginning: the, this, that, these, those, then, than, thus, there, they, their, them, and in some old words like thou, thee, etc. /t/ is normal English /t/. 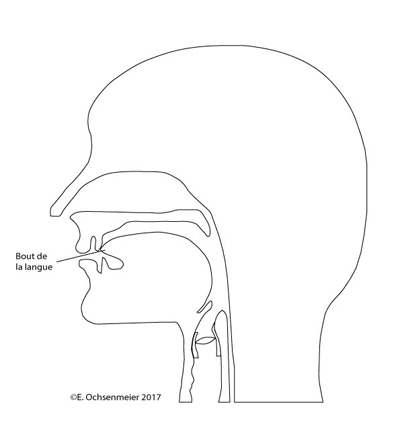 /θ, ð/: the position of the tongue is the same, touching the top front teeth, /θ/ is pronounced without vibration of the vocal chords, /ð/ with vibration. Don’t try to insert a /t/ when saying /θ, ð/. Be careful too not to say /f/ or /d/. The only sound that should come out is /s/ or /z/, but with the tongue close to the teeth to actually say /θ, ð/. Often, the best way to quickly improve your pronunciation is through private lessons with a teacher or someone who is trained in language instruction or to pay a coach. It’s a once in a lifetime investment. It’s like riding a bike, you never forget how to do it. There are, of course, many resources available on the internet. Ideally, you should listen to a lot of English. Our brain also learns by imitation. Two good sites: BBC for UK English and NPR for American English. Try to notice the different pronunciations of the “th.” It’s hard to reproduce sounds that you don’t really hear or are not used to hearing. The goal is not to be good at exercises with individual words but in normal speed speech. Spend time learning to say things in a normal context, not just words or small sentences. Some people might need a coach or a speech therapist. There are many exercises with individual words available. Here are a few more ideas.